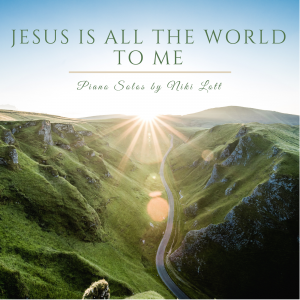 I am excited to announce that my piano CD, Jesus Is All the World To Me, will be arriving in just two days! I am thrilled to see this project completed. I recorded this CD many years ago, but for several reasons, I never released it. 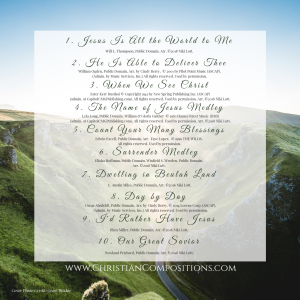 It includes some of my favorite hymns, and I am happy to get to share them with you. Three of the arrangements are from other arrangers, and the remaining seven are my own arrangements. Only one of these is currently in print, but I hope to have all of them available in the future. If you would like to get an idea of the style and sound, you can find sample clips of each song here. The CDs will retail for $14.95, but I am offering a pre-release price of $10 each through Monday (9/10). There is no limit on quantity, and no coupon code is needed. Orders will begin shipping on Tuesday. It is my hope that this CD will be uplifting, encouraging, and soothing to each listener, and that the message of each hymn will be conveyed through the music. I would love to hear what you think of this CD! Do you have suggestions for future arrangements? I would welcome those as well. This entry was posted in Christian Composition Updates, New Products and tagged Christian Compositions, Gospel piano, hymns, Niki Lott, piano CD. Bookmark the permalink.